The Garden to Linger In is as famous as the Humble Administrator's Garden. When this 30-mu affair west Suzhou was first built in 1595, or the 23rd year of the Wanli Reign of the Ming Dynasty, it was named Eastern Garden. The owner was Xu Taishi, vice-minister of the Court of the Imperial Stud. Later the garden changed hands repeatedly, and in this process underwent alterations and expansions on many occasions. In 1876 it was renamed "Garden to Linger In". Architectural structures make up one third of the entire garden and divide it into four zones that are different from each other in scenery. The central zone is composed of a sparkling pond surrounded by artificial hills on all four sides. Buildings take up the lion's share in the eastern zone, where doors are opened upon doors, and visitors are invariably attracted by exotic rocks and skillfully constructed artificial hills. The western zone is dominated by an idyllic artificial hill of giant proportions. Among all the gardens in Suzhou, the Garden to Linger In stands out for its well-conceived layout, spacious and elegant halls, and ingenious way in handling architectural space. The space is partitioned with chambers and halls, corridors, whitewashed walls and gateways. Size and height, straight lines and curves, shades and light - all these are alternated to bring about a spatial system in varying hues and contrasts. Hills, water surfaces and flowers and trees are combined to form a garden of multiple depths. 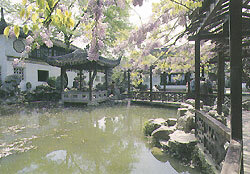 For its achievements in Chinese garden culture, the Garden to Linger In was known as "Number One Famous Garden in Central Suzhou".